Our Team – Join Us! 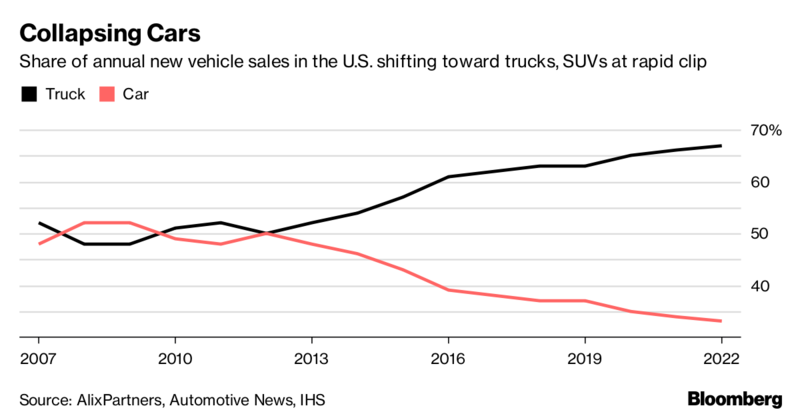 “Out with the old, in with the new” seems to be an accurate way to describe the trend happening in the out-performance of light trucks to its traditional car counterparts in new vehicle sales. For years, sales between light trucks (which includes SUVs and CUVs) and cars have been evenly split or even favored cars more because of their fuel economy. In the past three years it seems that trend has changed. The sale of light trucks have been dominating the auto industry and more people every day seem to be making the switch. Looking at the Bloomberg figure below annual vehicles sales were roughly 50/50 until about 2013. Since then, the sales of light trucks have stayed on a steady increase while car sales have struggled. In 2018 light truck sales dominated by a ratio of about 2:1. In December 2018, the number of reported passenger car sales were down 10.5% from 2017 at 462,389 vehicles. On the other hand in the same month, light truck sales were up about 7%, selling well over 1 million units. When looking at the full year of 2018 we see that light trucks increased 8% overall, reaching well over 11 million vehicles. Cars struggled, selling just about 5 and a half million vehicles. What is causing consumers to heavily favor light trucks (SUVs, CUVs, smaller pickups) over traditional smaller cars in the past few years? So why the switch? One reason families are favoring trucks is for the space. Light trucks hold more storage area and for the bigger families are more comfortable. An option for consumers who are looking for this are SUVs and CUVs. These two models serve as an alternative that consumers are purchasing because it gives them a high seat off the road and they get the same luxury feeling without purchasing a pickup. However, pickups are also being modified from a labor vehicle to a more luxurious everyday vehicle. Gas prices played a significant role in pushing more people to purchase light trucks. There is a clear correlation between the drop in gas prices and the steady climb of truck sales. The reasoning for this is the fact that consumers do not have to worry as much about gas prices making it more affordable to own bigger vehicles. Many automakers are starting to see the trend and have been refocusing their strategies. For example, Ford motor company has begun to cut back on the making of their popular car models and start producing more SUVs and CUVs. Ford is moving $7 billion in engineering funding away from cars and into SUVs. Volkswagen is another group following this trend, as they start to remove the well known “buggy” from American showrooms and around the globe soon after. 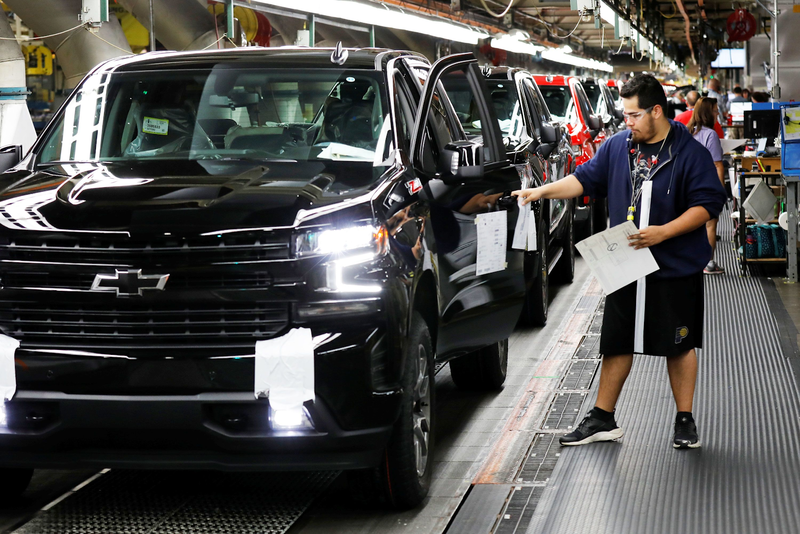 Changes in regulation made by the Trump administration for fuel-economy standard reduces the pressure for companies to reach a high miles per-gallon in their vehicles. This makes companies less attracted to making cars, and gives them an advantage to crack into this booming market. Sale of light trucks continue to dominate the auto industry and don’t seem to be letting up. The numbers speak for themselves, we are in the year of the truck. Advanced Remarketing Services offers innovative solutions to some of the remarketing industry's toughest questions. We sell wholesale, salvage and consumer markets to the most appropriate buyer base.